This week’s “In The Kitchen with Sharky and Jackie” is a few days late because I wasn’t 100% happy with the outcome and wanted to give it a day to “firm up” to see how it turned out- it was well worth the time! In the baking pan, stir everything together until it makes a crumbly dough and then form your crust on the bottom of the dish. The size baking dish you use depends on the thickness that you are going for. A small pan will result in less servings but thicker and a larger pan will give you more servings but thinner. Press the crust firmly down, evenly. Bake for 12-15 minutes until golden and firm- set aside and allow to cool so that it doesn’t instantly melt the next layer. While the crust is baking, use a hand mixer to beat the cream, vanilla extract and erythritol together until stiff peaks form. Then gradually beat in the softened cream cheese a little at a time until well combined. Now you’ve baked your crust and made the cream cheese layer while it was baking- work on this layer while you are allowing the crust to cool down. Beat they heavy cream, erythritol and vanilla until stiff peaks form and then add in the cocoa powder gradually while continuing to beat with mixer. 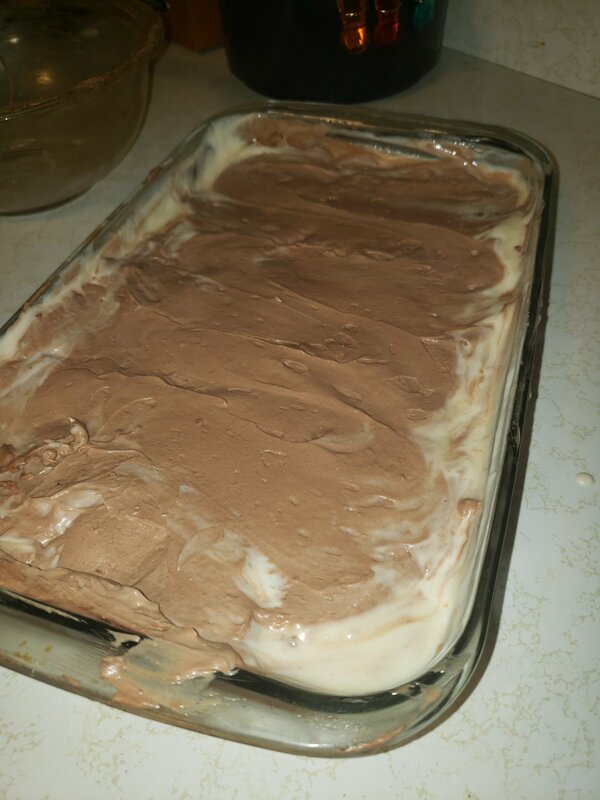 Now that the crust has cooled down and you have both layers ready to go- you just spread the cream cheese layer on first- put into the fridge for a few minutes to get it a chance to firm up and then add the chocolate layer. 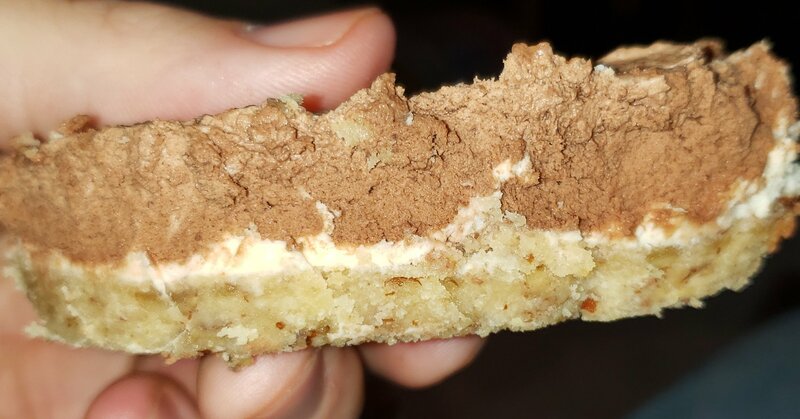 We made the mistake of adding both layers while the crust was hot- the cream cheese layer quickly melted and then it was impossible to get the chocolate layer on it so it all sort of blended together. We also tried a piece right after we made it and while it was good- the textured was weird and it was warm- this is MUCH better the next day, after the layers have firmed and it’s more pie like. 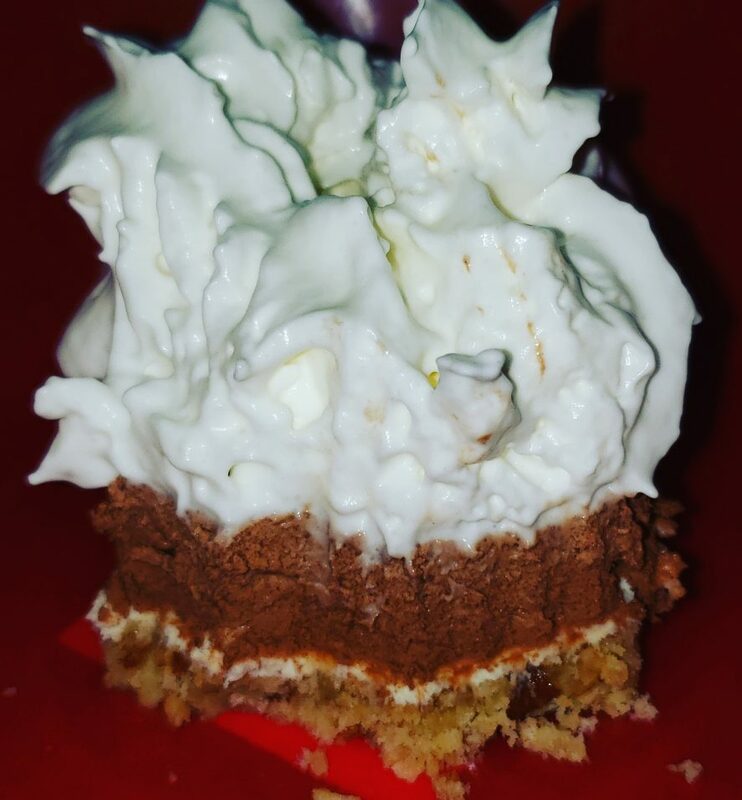 I threw on some whip cream from a can as yet another layer and it was delicious! As for the calories and MACROS- you will have to throw it into MyFitnessPal to get that information based on the ingredients you used and how much- ours will be different in the future since we are going to use less flour, more pecan, etc. I can tell you that the calories is probably pretty high so this is something to eat in moderation and to share with friends and family.